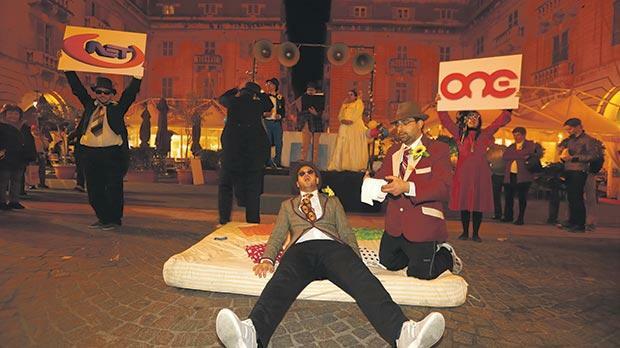 Immanuel Mifsud is penning this year’s Qarċilla, an irreverent and satirical performance of a mock wedding that has traditionally formed part of Carnival revelry. Ramona Depares asks him what we can expect. How do you describe the Qarċilla and what is the history behind it? In a nutshell, it is a public performance of a mock wedding, or rather a contract for a couple’s wedding, whereby they promise each other not only their everlasting loyalty but also bind themselves with legal promises of property which they will then share as a family. Traditionally, the Qarċilla is loud, base and rather contemp-tuous towards... well towards everything and everyone. Do you remember the older versions of carnival – what are your memories? Well, this might surprise you. I don’t like carnival and, therefore, I never go to carnival. I have scant childhood memories of watching carnival floats in Valletta and feeling very bored. For various reasons I’ve never had a carnival costume and I grew up resenting it. I’ve never been to Nadur or to any other place where carnival is celebrated. I accepted to write this year’s Qarċilla because the ritual interests me from a literary and anthro-poligical point of view, especially the most known version, written by a certain Feliċ Demarco, a priest from Cospicua. I became interested in the Qarċilla while writing my thesis on body representation and imagery in poetry... so it was basically an academic interest. Do you feel people still have an interest in the resurfacing of these old traditions? Well, for various reasons, mainly political, carnival got tamed. Traditionally, it was not meant to be four days of getting the crowd to Valletta to stand on the pavements looking at floats or sitting watching what we call the displays. Carnival, the traditional carnival, encouraged participation and it has been recorded that even while watching the Qarċilla the audience used to participate not least by pelting the performers and calling them names. So there had to be a conscious and planned effort to reintroduced long lost traditions which the people had no idea of. Are people interested in these traditions? Judging from the number of people who attended the Qarċilla performances in the recent past, it seems that yes, people are interested, not only for the revelry and comedy, but also for the political satire. What can people who show up for this year’s Qarċilla expect? Political satire, which is not restricted to politicians and social commentary, presented in a humorously indecent manner. Sometimes, it appears that in past years the Maltese were more open to the idea of irreverent satire, which had all but died until this recent revival. What are your thoughts about this? Yes, probably. But that is common in many other countries, especially those with a strong Catholic culture. Irreverence used to be the whole point of carnival, which is why watching colourful floats with figures taken from Disney and other cartoons has nothing to do with the original concept of carnival. I think had Fr Feliċ Demarco and his contemporaries been resurrected in the late 20th and early 21st century to attend the carnival celebrations they would have been bored to death. Again, satire was part and parcel of carnival. When power prohibited it through censorship and legislation it basically stripped carnival of its potential to resistance and tamed the whole affair. I am mentioning resistance because satire, when employed by the man in the street, takes the form of resistance against power. For a long period of time, those in power managed to suppress all this because it is a very well-known fact that satire is a political tool. What are the biggest challenges in bringing the Qarċilla to life? I suppose the biggest challenge was to revive an old tradition which basically only historians and cultural students knew about. Can you give us a sneak peak of who is likely to be a target in this year’s Qarċilla? Just a sneak peak: this year’s Qarċilla will feature two former MEPs, although they won’t be the protagonists. Is there such a thing as going too far with a joke? Well, there is this ongoing debate recently brought back to the fore by Charlie Hebdo, probably the most notriously irreverent publication. The recent controversy provoked by the cartoon showing the Kurdish boy whose lifeless body was washed up on a Turkish beach shows that it is not easy to decide whether there should be limits imposed on the joke. I have thought a lot about this, and if I have to be honest I must admit I haven’t formed an opinion yet. But I have to admit also that I do feel put off by certain jokes and sometimes I may feel hurt too. This hurt and humiliation Zizek writes about in his book Zizek’s Jokes is the whole enjoyment of jokes and humour. It has long been argued that the joke is a transgressive human activity which, more often than not, is by its very nature politically and ethically incorrect. Will children also be able to appreciate some of the jokes, or is it strictly targeted towards adults? No, this is strictly adult material. I have tried to be loyal to the original spirit of the Qarċilla, with Demarco’s very lewd version as the primary inspiration. The Qarqċilla will be performed at St John’s Square, Valletta, on February 6 at 5, 6, 7 and 8pm; and on February 7 at 3, 4 and 5pm. Entrance is free. On February 8, a special presentation will be held at Fort St Angelo. Tickets for this event are available online.